Sotheby's sells World's Most Expensive Book for $14 Million! The first book printed, in what is today the United States of America, sold for more than $14 million at Sotheby's auction in New York Tuesday. 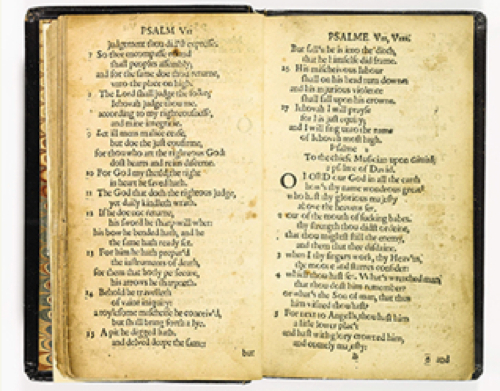 The translation of Biblical psalms "The Bay Psalm Book" was printed by Puritan settlers in Cambridge, Massachusetts in 1640 and was sold at a one-lot auction by Sotheby's. The bidding opened at $6 million and closed just minutes later at a premium price of $14.165 million. The identity of the buyer was not immediately announced. The settlers, who came to America to seek religious freedom, set about making their own preferred translation from the Hebrew original of the Old Testament book. "'The Bay Psalm Book' is a mythical rarity. Unseen on the marketplace for more than two generations, it has become too rare to collect," said David Redden, head of Sotheby's books. Redden said the volume had even greater significance than being the first book printed or written in America. "This little book of 1640 was precursor to Lexington and Concord, and, ultimately, to American political independence. With it, New England declared its independence from the Church of England," he said. There were 1,700 copies of the original 1640 edition. The eleven that have survived until today are in collections such as The Library of Congress in New York and Harvard College Library. No copy had appeared at auction since 1947, when a different copy fetched $151,000 -- a record at the time for any book, including the Gutenberg Bible or Shakespeare's First Folio.